This month’s playlist has been chosen by music video platform Vevo. 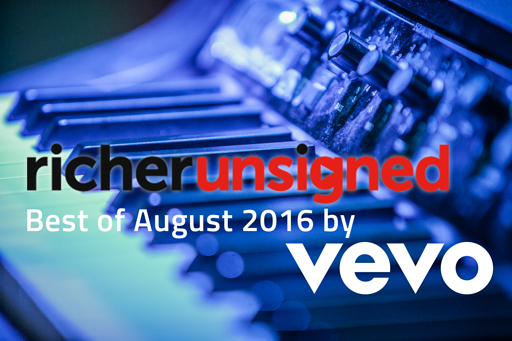 They have chosen 10 of their favourite new artists to form the ‘Best of August 2016′ Richer Unsigned playlist. Vevo has over 18 bn global views a month, and is available on desktop, mobile and living room devices. As well as being home to the biggest music acts from around the world, central to Vevo is a commitment to support and nurture new talent. Through original programming, Vevo has created several strands of programming to create exclusive content with artists, from the earliest stages of their careers. Sälen met in 2015. They are from East-London and make straight-talking, left-of-center pop music. IDER emerged in April this year with their subtle, R&B-tinged debut track ‘Sorry’. Quickly enticing fans from Aurora to Tourist to Shura and drawing comparisons to Wet, London Grammar, Oh Wonder and FKA Twigs; ‘Sorry’ received immediate support from BBC Radio 1’s Phil Taggart, who contacted the band within minutes of the track going live on SoundCloud. Days later, Taggart plugged IDER as one of his Future Firsts on his weekly show. Megan and Lily’s followup track, the vulnerable, beautifully balanced ‘Pulse’, has gone on to receive over 200,000 streams on Spotify alone since its release in June. New Desert Blues are a 5 piece band influenced by the likes of The National, The War on Drugs and Ennio Morricone. Loa Loa tread the fine line between indie and punk, their gritty sound is dominated by a brilliantly brash in-your-face attitude something that exhumes from their acclaimed debut EP ‘IX . V . V . VI’. Having received plays across Radio 1 from Huw Stephens and Phil Taggart the band are currently working on their follow up EP which is expected out before the end of the year.